Assessing biodiversity in forests requires a reliable and sustainable monitoring concept, which must include all levels of diversity, the genetic, the species and the landscape level. Diversity studies should not be reduced to quantitative analysis, but qualitative interpretations are an important part for the understanding of the results. Also, the linkage of terrestrial data and remote sensing data as well the implementation of abiotic and biotic data collected on existing monitoring systems are useful sources to analyse cause-effect relationships and interactions between the different aspects of diversity. Der Begriff Biodiversität. Nova Acta Leopoldina NF87 328: 51-71. Map of the natural vegetation of Europe. Federal Agency for Nature Conservation, Bonn, Germany. European forest types - Categories and types for sustainable forest management reporting and policy. EEA Technical report No 9/2006. European Enviroment Agency, Copenhagen, Denmark. Zeigerwerte von Pflanzen in Mitteleuropa. Scripta Geobotanica 18: 6-199. Assessment of Ground Vegetation. ForestBIOTA work report. Plant strategies and vegetation processes. Wiley, London, UK, pp. 222. Biodiversity: measurement and estimation. Philosophical transactions of the Royal Society of London Series B Biological sciences 345: 5-12. Climate change 2007: the physical science basis. Summary for policymakers. Contribution of Working Group I to the Fourth Assessment Report of the Intergovernmental Panel on Climate Change. WMO, Geneva, Switzerland, pp. 21. GAB analysis: concepts, methods, and recent results. Landscape Ecology 15: 5-20. Applying objective data for a multi temporal analysis of habitat suitability indices to monitor biodiversity: a case study for the example key species Red kite (Milvus milvus) and Black stork (Ciconia nigra). Dissertation Universität Hamburg, Hamburg, Germany, pp. 221. Reference sample plots to combine field measurements and satellite data in forest inventories. Research Notes 19, Department of Forest Mensuration and Management, University of Helsinki, pp. 209-215. Kritische Anmerkungen zum theoretischen Konzept der potentiellen natürlichen Vegetation mit Anregungen zu einer zeitgemäßen Modifikation. Tüxenia 7: 53-67. Bedeutung trockener Sommer für Wachstumsfaktoren von verschiedenen Herkünften der Rotbuche (Fagus sylvatica L.). AFZ - Der Wald 62: 246-248. Weiterentwicklung von Indikatoren zur Erfassung der Fragmentierung von Wäldern unter Berücksichtigung der Datenverfügbarkeit. Arbeitsbericht des Instituts für Weltforstwirtschaft der Bundesforschungsanstalt für Forst- und Holzwirtschaft und dem Zentrum für Holzwitschaft Universität Hamburg, 2006/2, pp. 43. Definition of a system of nomenclature for mapping European forests and for compiling a pan European forest information system. FIRS Final Report. Eignung von Diversitätsindizes bei Langzeituntersuchungn zur Biodiversität in Waldbeständen. Allgemeine Forst- und Jagdzeitung 167 (4): 76-85. Land cover changes in Europe from the 1950’s to 2000. Institute for Wordforestry, University of Hamburg, Hamburg, Germany, pp. 364. Biodiversity evaluation tools for european forests. Ecological Bulletins 50, pp. 237. FRACSTATS. Spatial pattern analysis program for quantifying landscape structure - version 2.0. Corvallis, pp. 67. Indices of landscape patterns. Landscape Ecology 5: 153-162. 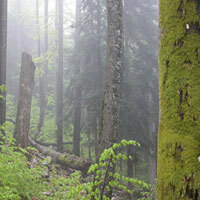 Development and harmonization of a Forest Status Indicator (FSI). European Enviroment Agency and Italian Forest Service, CONECOFOR Board. Liste der in Deutschland typischen Waldgefäßpflanzen. Mitteilungen der Bundesforschungsanstalt für Forst- und Holzwirtschaft 212, pp. 66. Relationships between forest floor vegetation on ICP Forests monitoring plots in Europe and basic variables in soil and nitrogen deposition. International Journal of Environmental Studies 65 (3): 309-320. The mathematical theory of communication. University of Illinois Press, Urbana 1949. Kombination von terrestrischen Aufnahmen und Fernerkundungsdaten mit Hilfe der kNN-Methode zur Klassifizierung und Kartierung von Wäldern. Dissertation. Technische Universität Dresden. Lehrstuhl für Forstliche Biometrie und Informatik. Floristic changes in the herb-layrt of a deciduous forest in the Lorraine Plain under the influence of atmospheric deposition. Forest Ecology and Management 55: 149-167. Satellite image-based national forest inventory of Finland. International Archives of Photogrammetry and Remote Sensing 28 (7-1): 419-424. Die heutige potentielle natürliche Vegetation als Gegenstand der Vegetationskartierung. Angewandte Pflanzensoziologie 13: 64-98. Biodiversity: from Babel to biosphere management. Special features in biosystematics and biodiversity 2, Uppsala, Sweden, pp. 59. Charakterisierung der Landschaftsstruktur mit Methoden der Satelliten-Fernerkundung und der Geoinformatik (Dissertation). TU Dresden, pp. 190. Is there a trade-off between species diversity and genetic diversity in forest tree communities? Plant Ecology 185: 151-161. Dominance and diversity in land plant communities. Science 147: 250-260. Evolution and measurement of species diversity. Taxon 21: 213-251.